We as humans are faced with choices every day; choices about how we spend our time, money, and energy; choices about what we ignore, and what we prioritize. As a community of faith, we believe that to make those choices well we need to be grounded in the Gospel. And the best way we can express what it means to be “grounded in the Gospel” is to share with you what we believe the Gospel is calling us to value most. We believe in a God of incredible grace. A God who created us and saved us, and who wants to walk through life in fellowship with us. We also believe that a vital part of this journey is to seek to know God better – getting to know who God is, what God values, what God’s vision is. We believe that God’s #1 priority is people. It can be easy to embrace only those who are like us; but we believe in a God who welcomes us in all our diversity just as we are, with no strings attached. We believe that we were made to live life in community as the family of God. For us, this means that we are committed to safe, nurturing life groups that are the building blocks of a church big enough to make an impact, but small enough to care. While we believe that the Gospel is for everyone, we should not have a one-size-fits-all approach to how we share it. Throughout Scripture we see a God who meets humans where they are, speaking to their experiences, and we are committed to doing the same. We believe in a God who is leading us forward, who has a vision and a purpose and a plan. And so while we are committed to passing on what has been given to us, we are also eager to see and invest in the new and different ways in which God is calling the next generation to serve. We believe our actions express the kind of God that we believe in. That the God we believe in is one of justice, compassion, mercy, and grace. One who takes special notice of the marginalized, and who cares deeply about those people others often overlook. 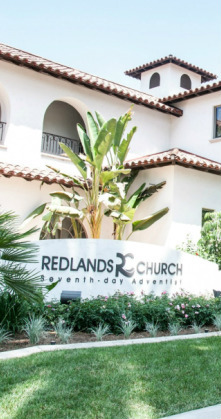 We believe God is calling the Redlands Church towards a specific mission in the Redlands community and beyond. We believe that to accomplish our mission requires us all to work together, to pray together, and to rise and fall together. We believe God is calling us out of our comfort zones for a bigger vision, and we are committed to following.